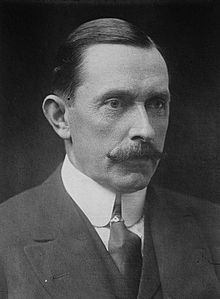 Colonel Wilfrid William Ashley, 1st Baron Mount Temple, PC (13 September 1867 – 3 July 1939), was a British soldier and Conservative politician. He served as Minister of Transport between 1924 and 1929 under Stanley Baldwin. Ashley was the son of Evelyn Ashley, second surviving son of the social reformer Anthony Ashley-Cooper, 7th Earl of Shaftesbury. His mother was Sybella Charlotte Farquhar, daughter of Sir Walter Farquhar, 3rd Baronet. William Cowper-Temple, 1st Baron Mount Temple, was his great-uncle. He was educated at Harrow and Magdalen College, Oxford. Ashley, who held the rank of Colonel in the British Army, was well known as an activist in various pressure groups before commencing his party political career. He was a leading figure in the Navy League and also set up the anti-state intervention No More Waste Committee during the First World War. He was subsequently involved in the foundation of the Comrades of the Great War in 1917 and as President of the group helped to ensure that the ex-servicemen's movement was closely linked to the Conservative Party at its foundation. Ashley was elected to parliament in 1906 to represent Blackpool, holding the seat until 1918 before subsequently sitting as member for Fylde until 1922 and New Forest from 1922 to 1932. He served under Bonar Law and Stanley Baldwin as Parliamentary Secretary to the Ministry of Transport and Parliamentary Secretary to the Office of Works from October 1922 until October 1923, when he was appointed Under-Secretary of State for War, which he remained until January 1924. Ashley was sworn of the Privy Council in February 1924 and when the Conservatives returned to power under Baldwin in November of that year he was made Minister for Transport, an office he retained until the fall of the Baldwin administration in 1929. He left the House of Commons in 1932 and was raised to the peerage as Baron Mount Temple, of Lee in the County of Southampton, a revival of the title held by his great-uncle. Lord Mount Temple remained active within the House of Lords and was a vocal supporter of the policy of appeasement towards Nazi Germany. He admired Adolf Hitler for his anti-communism, although much of his conviction rested on the belief that the Treaty of Versailles had been unjust to begin with and that it should be revised regardless of who was in government in Germany. In 1935 in order to underline his support for the Germans Ashley was instrumental in establishing the Anglo-German Fellowship. He served as chairman of both this group and Anti-Socialist Union simultaneously in the later 1930s. As AGF chairman, Lord Mount Temple (as he now was) visited Germany in mid 1937 and held a meeting with Hitler. Unlike some of his contemporaries in the Fellowship, the laissez-faire capitalist Mount Temple did not support ideological Nazism (perhaps due in part to the fact that his wife was Jewish). In the aftermath of Kristallnacht he resigned in protest from the chairmanship although his membership of the group continued. Ruth Mary Clarisse (1906–1986), who married Alec Cunningham-Reid (1895–1977) in 1927. They divorced in 1940 and in 1944 she married Thomas Cholmondeley, 4th Baron Delamere (1900–1979). They divorced in 1955. 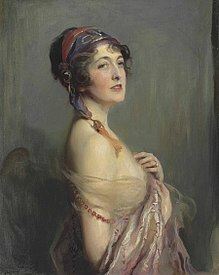 Following his first wife's early death in 1911, he married in 1914 Muriel Emily ("Molly") Forbes-Sempill, the former wife of Rear-Admiral The Hon. Arthur Forbes-Sempill, daughter of The Rev. Walter Spencer of Fownhope Court, Herefordshire and sister of Margery Greenwood, Viscountess Greenwood. Lady Mount Temple had an interest in interior decoration and floral design, which was then highly fashionable; she had a florist business named Flower Decorations. The couple commissioned the architect Oliver Hill to design two Westminster town houses, naming them both Gayfere House. The first house, built at 12 Gayfere Street (1923–26), had a drawing room completely decorated with gold leaf. The second, at the corner of Gayfere Street and Great Peter Street (1929–32), was decorated in Art Deco style, making much use of mirrored walls and ceilings, most famously in a bathroom called by the Press "Lady Mount Temple's Crystal Palace". She died in 1954. Lord Mount Temple died in July 1939, aged 71, when the barony became extinct. ^ "No. 32910". The London Gazette. 22 February 1924. p. 1549. ^ "No. 32992". The London Gazette. 14 November 1924. p. 8241. ^ "No. 33790". The London Gazette. 15 January 1932. p. 346. ^ "Lady Delamere, Figure in Murder," New York Times. September 5, 1987. ^ a b c Powers, Alan (2008). The Twentieth Century House in Britain: From the Archives of Country Life. London: Aurum Press. pp. 38–41. ISBN 1-84513-012-X. ^ Powers, Alan (1989). Oliver Hill: Architect and Lover of Life 1887–1968. London: Mouton Publications. p. 65. ISBN 0-9514250-0-5. ^ Historic England. "North House and Gayfere House (1357066)". National Heritage List for England. Retrieved 19 February 2015. This page was last edited on 11 February 2019, at 22:27 (UTC).